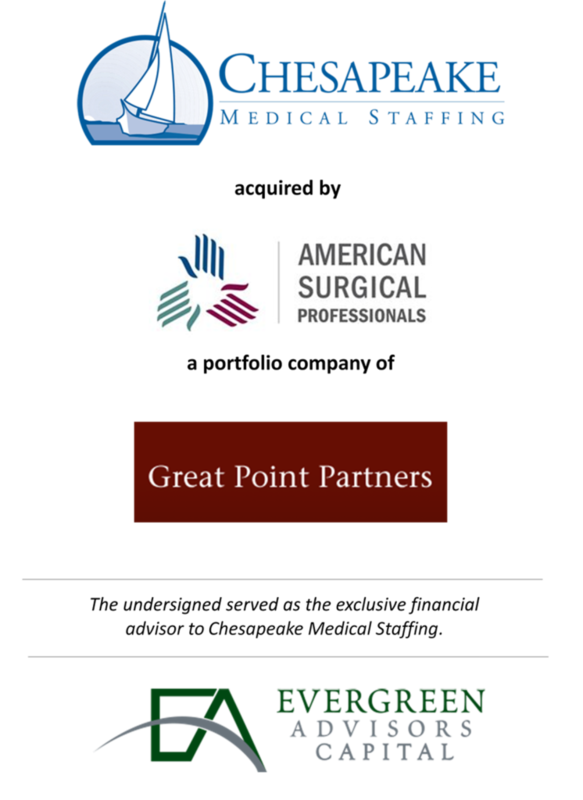 Evergreen Advisors Capital, a middle-market investment bank, is pleased to announce that Chesapeake Medical Staffing, LLC (“Chesapeake”) has been acquired by American Surgical Professionals (“ASP”). Evergreen Advisors Capital acted as the exclusive financial advisor to Chesapeake. Founded in 2001 and headquartered in Lutherville-Timonium, MD, Chesapeake Medical Staffing is one of the largest and most respected health care staffing agencies in the mid-Atlantic region. CMS has focused on sourcing the highest quality health care professionals from nurses to administrative personnel to physicians to complete management of the agency process. The Company is Joint Commission certified and their client list includes hospitals, institutional care providers, management services organizations (MSO), home care and individual patients. CMS’s impressive range of available medical professionals on a per diem or contract basis combined with customer service that is second to none has been the impetus for a growing list of satisfied customers. For more information, please visit www.cms24-7.com or call 410-321-4267. Founded in 1993 and headquartered in Houston, TX, American Surgical is the nation’s leading provider of professional surgical assistant services to hospitals, clinics (ASC), surgeons and patients. The Company offers custom tailored solutions to perioperative staffing situations. These include providing surgical specialists on an outsourced, as needed or contract basis. In addition to being Joint Commission certified, ASP’s professionals are experienced in all state-of-the-art technologies such as robotics and current medical techniques such as endoscopic vein harvesting. The utilization of ASP’s services results in improved outcomes for surgical procedures, enhanced economics and a reduction of staff management complexities. For more information, please visit www.amerisurg.com or call 713-779-9800.